Dark City is a 1998 neo-noir science fiction film directed by Alex Proyas and starring Rufus Sewell, Kiefer Sutherland, Jennifer Connelly, and William Hurt. The screenplay was written by Proyas, Lem Dobbs and David S. Goyer. Sewell plays John Murdoch, an amnesiac man who finds himself suspected of murder. Murdoch attempts to discover his true identity and clear his name while on the run from the police and a mysterious group known only as the "Strangers". The majority of the film was shot at Fox Studios Australia. It was jointly produced by New Line Cinema and Mystery Clock Cinema. New Line Cinema distributed the theatrical release. The film premiered in the United States on February 27, 1998. The film was nominated for Hugo and Saturn Awards. For the theatrical release, the studio was concerned that the audience would not understand the film and asked Proyas to add an explanatory voice-over narration to the introduction. A director's cut was released in 2008, restoring and preserving Proyas's original artistic vision for the film. Some critics have noted its similarities and influence on the Matrix series, which came out a year later. John Murdoch awakens in a hotel bathtub, suffering from amnesia. He receives a phone call from Dr. Daniel Schreber, who urges him to flee the hotel to evade a group of men who are after him. In the room, Murdoch discovers the corpse of a ritualistically murdered woman along with a bloody knife. He flees the scene, just as the group of pale men in trenchcoats (later identified as "the Strangers") arrive. Following clues, Murdoch learns his own name and finds out he has a wife named Emma; he is also sought by Police Inspector Frank Bumstead as a suspect in a series of murders committed around the city, though he cannot remember killing anybody. Pursued by the Strangers, Murdoch discovers that he has psychokinesis—which the Strangers also possess, and refer to as "tuning": the ability to alter reality at will. He manages to use these powers to escape from them. Murdoch explores the anachronistic city, where nobody seems to realize it is always night. At midnight, he watches as everyone except himself falls asleep as the Strangers physically rearrange the city as well as changing people's identities and memories. Murdoch learns that he came from a coastal town called Shell Beach: a town familiar to everyone, though nobody knows how to get there, and all of his attempts to do so are unsuccessful for varying reasons. Meanwhile, the Strangers inject one of their men, Mr. Hand, with memories intended for Murdoch in an attempt to predict his movements and track him down. Murdoch is eventually caught by Inspector Bumstead, who acknowledges Murdoch is most likely innocent, and by then has his own misgivings about the nature of the city. They confront Schreber, who explains that the Strangers are extraterrestrials who use corpses as their hosts. Having a hive mind, the Strangers are experimenting with humans to analyze their individuality in the hopes that some insight might be revealed that will help their race survive. Schreber reveals that Murdoch is an anomaly who inadvertently awoke when Schreber was in the middle of imprinting his latest identity as a murderer. The three embark to find Shell Beach, but it exists only as a poster on a wall at the edge of the city. Frustrated, Murdoch and Bumstead break through the wall, revealing outer space. The men are confronted by the Strangers, including Mr. Hand, who holds Emma hostage. In the ensuing fight, Bumstead and one of the Strangers fall through the hole into space, revealing the city as a deep space habitat surrounded by a force field. The Strangers bring Murdoch to their home beneath the city and force Schreber to imprint Murdoch with their collective memory, believing Murdoch to be the culmination of their experiments. Schreber betrays them by instead inserting false memories in Murdoch which artificially reestablish his childhood as years spent training and honing his tuning skills and learning about the Strangers and their machines. Murdoch awakens, fully realizing his skills. He frees himself and battles with the Strangers, defeating their leader Mr. Book in a psychokinetic fight high above the city. After learning from Schreber that Emma has been re-imprinted and cannot be restored, Murdoch exercises his new-found powers, amplified by the Strangers' machine, to create an actual Shell Beach by flooding the area within the force field with water and forming mountains and beaches. On his way to Shell Beach, Murdoch encounters a dying Mr. Hand and informs him that they have been searching in the wrong place—the mind—to understand humanity. Murdoch turns the habitat toward the star it had been turned away from, and the city experiences sunlight for the first time. He opens a door leading out of the city, and steps out to view the sunrise. Beyond him is a pier, where he finds the woman he knew as Emma, now with new memories and a new identity as Anna. Murdoch reintroduces himself as they walk to Shell Beach, beginning their relationship anew. Alex Proyas based the Strangers on Richard O'Brien's character in The Rocky Horror Show, Riff Raff. Proyas said, "I had Richard in mind physically when I wrote the character, because I had these strange, bald-looking men with an ethereal, androgynous quality." When Proyas visited London to cast for the film, he met with O'Brien and found him suitable for the role. Kiefer Sutherland's character Daniel P. Schreber is named after Daniel Paul Schreber, a German judge who suffered from narcissistic, paranoid psychosis and possibly schizophrenia and whose autobiographical Memoirs of My Nervous Illness (Denkwürdigkeiten eines Nervenkranken) the film's plot alludes to at various instances. Hurt was originally asked to play Dr. Schreber. One of the things that we're exploring in this film, is what it is that makes us who we are. And, when you strip an individual of his identity, is there some spark, some essence there that keeps them being human, gives them some sort of identity? Theologian Gerard Loughlin interprets Dark City as a retelling of Plato's Allegory of the Cave. For Loughlin, the city dwellers are prisoners who do not realize they are in a prison. John Murdoch's escape from the prison parallels the escape from the cave in the allegory. He is assisted by Dr. Schreber, who explains the city's mechanism as Socrates explains to Glaucon how the shadows in the cave are cast. Murdoch however becomes more than Glaucon; Loughlin writes, "He is a Glaucon who comes to realize that Socrates' tale of an upper, more real world, is itself a shadow, a forgery." Murdoch defeats the Strangers who control the inhabitants and remakes the world based on childhood memories, which were themselves illusions arranged by the Strangers. Loughlin writes of the lack of background, "The origin of the city is off–stage, unknown and unknowable." Murdoch now casts new shadows for the city inhabitants, who must trust his judgment. Unlike Plato, Murdoch "is disabused of any hope of an outside" and becomes the demiurge for the cave, the only environment he knows. The city in Dark City is described by Higley as a "murky, nightmarish German expressionist film noir depiction of urban repression and mechanism". The city has a World War II dreariness reminiscent of Edward Hopper's works and has details from different eras and architectures that are changed by the Strangers; "buildings collapse as others emerge and battle with one another at the end". The round window in Dark City is concave like a fishbowl and is a frequently seen element throughout the city. The inhabitants do not live at the top of the city; the main characters' homes are dwarfed by the bricolage of buildings. The film also contains motifs from Greek mythology, in which gods manipulate humans in a higher agenda. Proyas said, "I do like Greek mythology and have read a little of it, so maybe some of it has crept into the work, though I don't completely agree with that point of view." Proyas referenced film noir of the 1940s and the 1950s (such as The Maltese Falcon) as an influence for the film. It has additionally been described as Kafkaesque, and Proyas cited the TV series The Twilight Zone as a conscious influence. Proyas wanted the film, though nominally science fiction, to have an element of horror to unsettle the audience. Proyas co-wrote the screenplay with Lem Dobbs and David S. Goyer. Goyer had written The Crow: City of Angels, the sequel to Proyas's 1994 film The Crow; Proyas invited Goyer to co-write the screenplay for Dark City after reading Goyer's screenplay for Blade, which had yet to be released. Writers Guild of America initially protested at crediting more than two screenwriters for a film, but it eventually relented and credited all three writers. Proyas originally conceived a story about a 1940s detective who is obsessed with facts and cannot solve a case where the facts do not make sense. "He slowly starts to go insane through the story," says Proyas. "He can't put the facts together because they don't add up to anything rational." In the process of creating the fictional world for the character of the detective, Proyas created other characters, shifting the focus of the film from the detective (Bumstead) to the person pursued by the detective (Murdoch). Proyas envisioned a robust narrative where the audience could examine the film from the perspective of multiple characters and focus on the plot. The movie takes place everywhere, and it takes place nowhere. It's a city built of pieces of cities. A corner from one place, another from some place else. So, you don't really know where you are. A piece will look like a street in London, but a portion of the architecture looks like New York, but the bottom of the architecture looks again like a European city. You're there, but you don't know where you are. It's like every time you travel, you'll be lost. The production design included themes of darkness, spirals, and clocks. There appears to be no sun in the city's world, and spiral designs that shrink when approached were used in the film. A major clock in the film shows no hours; Tatopoulos said, "But in a magical moment it becomes something more than just a clock." The production designer created the city architecture to have an organic presence with the structural elements. The Strangers are energy beings who reside in dead human bodies. When design first started, the filmmakers considered having the Strangers be bugs underneath but decided that the bug appearance was overused. Tatopoulos said Proyas wanted to make the Strangers energy beings, "Alex called me and said he wanted something like an energy that kept re-powering itself, re-creating itself, re-shaping itself, sitting inside a dry piece of human shape." The Strangers reside in a large underground amphitheater for their lair, where a human bust hides a large clock and a spiraling device changes the layout of the city above. The set for the lair was fifty feet (15 m) in height, where an average set is thirty-six feet (11 m). The lair set was built on a fairground in Sydney, Australia. The film's budget was $30–40 million, so the crew used inexpensive techniques to design the set, such as stretching canvas onto welded metal frames. The lair also had a rail conveyance that appeared expensive. Tatopoulos said, "We had, obviously, a car built, but we had just one built. We laid some rail for it to ride on. We made a section of corridor that we kept driving through all the time, and you end up believing this thing is running along forever." Proyas originally wanted the rail car to roll by various rooms, which was not feasible for the budget, so Tatopoulos and the crew used "replaceable elements and strong design textures" to mimic the impression of various rooms. The film soundtrack was released on February 24, 1998 by TVT Records label. It features music from the original score by Trevor Jones, and versions of the songs "Sway" and "The Night Has a Thousand Eyes" performed by singer Anita Kelsey. It also includes music by Hughes Hall from the trailer, a song by Echo & the Bunnymen that played over the final credits, as well as songs by Gary Numan and Course of Empire that did not appear in the film. The music for the film was edited by Simon Leadley and Jim Harrison. The film's style is often compared to that of the works of Terry Gilliam (especially Brazil). Some stylistic similarities have also been noted to Jean-Pierre Jeunet and Marc Caro's 1995 film The City of Lost Children, another film inspired particularly by Gilliam (Gilliam had presented Jeunet's and Caro's previous film Delicatessen in North America, another film by Jeunet and Caro that was a deliberate homage to Gilliam's style). The Matrix was released one year after Dark City and was also filmed at Fox Studios in Sydney using some of the same sets. Comparisons have been made between scenes from the movies, making note of similarities in both cinematography and atmosphere, as well as the plot. Fritz Lang's 1927 movie Metropolis was a major influence on the film, showing through the architecture, concepts of the baseness of humans within a metropolis, and general tone. In one of the documentary shorts featured on the director's cut, the influence of the early German films M and Nosferatu are mentioned. One of the last scenes of the movie, in which buildings "restore" themselves, is similar to the last panel of the Akira manga. Proyas called the end battle a "homage to Otomo's Akira". Dark City has also drawn comparisons to the anime films Urusei Yatsura 2: Beautiful Dreamer (1984) and Megazone 23 (1985), and the 1993 video game Gadget Invention, Travel, & Adventure. When Christopher Nolan first started thinking about writing the script for Inception, he was influenced by "that era of movies where you had The Matrix, you had Dark City, you had The Thirteenth Floor and, to a certain extent, you had Memento, too. They were based in the principles that the world around you might not be real". Dark City was titled Dark World and Dark Empire leading up to the film's release. Warner Bros. wanted the filmmakers to consider the alternate titles due to the release of similarly titled Mad City in the same time frame, but Dark City was ultimately kept as the final title. The film was originally scheduled to be released in theaters on October 17, 1997, and it was later scheduled for January 9, 1998. The film would premiere in theaters nationwide in the United States on February 27, 1998, screening at 1,754 cinemas. Among mainstream critics in the U.S., the film received generally positive reviews. Review aggregator Rotten Tomatoes reports that 75% of 81 sampled critics gave the film a positive review, with an average score of 6.9/10 and the site's critical consensus stating: "Stylishly gloomy, Dark City offers a polarizing whirl of arresting visuals and noirish action". At Metacritic, which assigns a weighted average out of 100 to critics' reviews, the film received a score of 66 based on 23 reviews. "No movie can ever have too much atmosphere, and Dark City exudes it from every frame of celluloid. Proyas' world isn't just a playground for his characters to romp in — it's an ominous place where viewers can get lost. We don't just coolly observe the bizarre, ever-changing skyline; we plunge into the city's benighted depths, following the protagonist as he explores the secrets of this grim place where the sun never shines. Dark City has as stunning a visual texture as that of any movie that I've seen." Roger Ebert writing in the Chicago Sun-Times called it a "great visionary achievement," while also exclaiming that it was "a film so original and exciting, it stirred my imagination like Metropolis and 2001: A Space Odyssey." In the San Francisco Chronicle, Peter Stack wrote that the film was "among the most memorable cinematic ventures in recent years", and that "maybe there's nothing wrong with a movie that is simply sensational to look at." He felt the film's "twisting of reality and its daring look — layered and off-kilter grays, greens and blacks — make it click." In a mixed review, Walter Addiego of The San Francisco Examiner thought "as a story, Dark City doesn't amount to much." He believed Dark City contained a "complicated plot" while also having important themes that were "no more than window dressing". But on a positive front, he wrote, "what counts here is the show, the creation of a strange world by a filmmaker who clearly knows science fiction and fantasy, past and present, and wants to share his love for it." Left unimpressed, Marc Savlov of The Austin Chronicle wrote, "You really have to feel for Alex Proyas. This guy wears bad luck like the grimy trenchcoats of his protagonists, only his zipper's stuck and he can't seem to shake the damn thing off." In expressing his negativity, he believed "Dark City looks like a million bucks (or rather, a million bucks gone to compost), but at its dark heart it's a tedious, bewildering affair, lovely to look at but with all the substance of a dissipating dream." Left equally disappointed was John Anderson of the Los Angeles Times. Commenting on the directing, he thought "If you had to guess, you might say that Proyas came out of the world of comic art himself, rather than music videos and advertising. Dark City is constructed like panels in a Batman book, each picture striving for maximum dread." He went on to say, Proyas was "trying simultaneously to create a pure thriller and sci-fi nightmare along with his tongue-in-cheek critique of artifice. And this doesn't work out quite so well." Author TCh of Time Out, felt the development of the Murdoch character was "surprisingly engrossing" and thought production wise, the "art direction is always striking, and unlike most contemporary sci-fi, the movie does risk a cerebral approach, tapping a vein of postmodern paranoia." Writing for Time, Richard Corliss said the film was "as cool and distant as the planet the Strangers come from. But, Lord, is Dark City a wonder to see." James Berardinelli writing for ReelViews, remarked that "Visually, this film isn't just impressive, it's a tour de force." and noted that "Dark City opens by immersing the audience in the midst of a fractured, nightmarish narrative." Berardinelli also said "Dark City appears to be New York during the first half of this century, but, using a style that is part science fiction, part noir thriller, and part gothic horror, he has embellished it to create a surreal place unlike no other." Describing some pitfalls, Jeff Vice of the Deseret News said that "when critics talk about films being 'style over substance,' they're definitely talking about movies like Dark City, which looks good but leaves an unpleasant aftertaste." Vice however was quick to admit, "The special effects and set designs are dazzling", but ultimately believed "Proyas makes a crucial error in treating the subject even more seriously than The Crow, and the dialogue (co-written by Proyas and The Crow: City of Angels scriptwriter David S. Goyer) is unintentionally funny at times and often just plain dumb." Andrea Basora of Newsweek, stated that director Proyas flooded the screen with "cinematic and literary references ranging from Murnau and Lang to Kafka and Orwell, creating a unique yet utterly convincing world". Similarly, David Sterritt wrote in the Christian Science Monitor that "The story is dark and often violent, but it's told with a remarkable sense of visual energy and imagination." Additionally, Marshall Fine of USA Today, found the film to be "Fascinating, visionary filmmaking." and "With its amber-tinged palette and its distinctively dystopian view of life, it may be the most unique-looking film we've seen in ages...[but] defies logic and makes frightening and unexpected leaps." Critic Stephen Holden of The New York Times wrote that the "plot that Dark City builds on John's predicament is a confused affair" and that the film's premise is "unsettling enough to make you wonder if it could actually derail a seriously drug-addled mind." Steve Biodrowski of Cinefantastique found the production design and the cinematography overwhelming, but he considered the narrative engagement of Sewell's amnesiac character to be ultimately successful. Biodrowski writes, "As the story progresses, the pieces of the puzzle fall into place, and we gradually realize that the film is not a murky muddle of visuals propping up a weak story. All the questions lead to answers, and the answers make sense within the fantasy framework." The reviewer compared Dark City to the director's preceding film The Crow in style but found Dark City to introduce new themes and to be a "more thoroughly consistent" film. 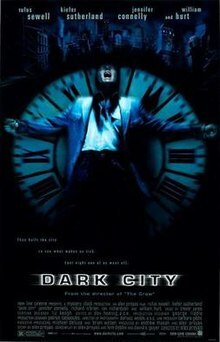 Biodrowski concluded, "Dark City may not provide profound answers, but it deals seriously with a profound idea, and does it in a way that is cathartic and even uplifting, without being contrived or condescending. As a technical achievement, it is superb, and that technique is put in the service of telling a story that would be difficult to realize any other way." The film won and was nominated for several awards in 1998. Film critic Roger Ebert cited it as the best film of 1998. In 2005, he included it on his "Great Movies" list. Ebert used it in his teaching, and also appears on a commentary track for the original DVD and the 2006 Director's Cut. The film was screened out of competition at the 1998 Cannes Film Festival. Dark City premiered in cinemas on February 27, 1998 in wide release on 1,754 screens in the U.S., and grossed $5,576,953 on its opening weekend, placing 4th, far behind Titanic in 1st place with $19,633,056. The film's revenue dropped by 49.1% in its second week of release, earning $2,837,941, dropping to 9th, while Titanic remained in first place with $17,605,849. The film went on to earn $14,378,331 domestically in total ticket sales through a 4-week theatrical run. Internationally, the film took in an additional $12,821,985 in box office business for a combined worldwide total of $27,200,316. The film's cumulative gross ranked 105th for 1998. The film was released in VHS video format on March 2, 1999. The Region 1 Code widescreen edition of the film was released on DVD in the United States on July 29, 1998. Special features for the DVD include two audio commentary tracks, one with film critic Roger Ebert, and one with director Alex Proyas, writers Lem Dobbs and David Goyer, and production designer Patrick Tatopoulos. The DVD also includes biographies, filmographies, comparisons to Fritz Lang's Metropolis, set designs, and the theatrical trailer. A director's cut of Dark City was also officially released on DVD and Blu-ray Disc on July 29, 2008. The director's cut removes the opening narration, which Proyas felt explained too much of the plot, and restores it to its original location in the film. It also includes 15 minutes of additional footage, mostly consisting of extended scenes with additional establishing shots and dialogue. Expanded audio commentaries by Ebert, Proyas, Dobbs and Goyer are included, along with several new documentaries. The Blu-ray disc additionally includes the original theatrical cut and the special features from the 1998 DVD release. ^ "Dark City". British Board of Film Classification. Retrieved January 3, 2017. ^ "Dark City (1998) - Financial Information". The Numbers. Retrieved August 8, 2011. ^ a b c d "Dark City (1998)". Box Office Mojo. Retrieved August 29, 2010. ^ Helms, Michael (May 1998). "Dark City: Interview with Andrew Mason and Alex Proyas". Cinema Papers. North Melbourne: Cinema Papers Pty Ltd. (124): 18–21. ISSN 0311-3639. ^ Ebert, Roger (31 March 1999). "The Matrix". RogerEbert.com. Retrieved 18 September 2015. ^ "Dark City vs The Matrix". RetroJunk. 17 August 2015. Retrieved 18 September 2015. ^ Tyridal, Simon (28 January 2005). "Matrix City: A Photographic Comparison of The Matrix and Dark City". ElectroLund. Retrieved 18 September 2015. ^ Kemble, Gary (2009). Movie Minutiae: Dark City (1998). ABCNews. Articulate: Daily talk on arts news and events. 2009-03-28. Retrieved 2010-04-10. ^ Proyas, Alex (Director) (2008). Dark City (Director's Cut Commentary) (DVD). Event occurs at 1:15:23-1:17:40. And so for me, the love story aspect of this film, the love affair between Murdoch and his wife, that kind of grows and sort of comes to a culmination in this scene, [Scene 12, "Do You Remember?"] is for me exploring that idea, and how, when you take away both of these people, these character's identity, is there something left, something that they acknowledge or recognize within each other, that is expressed as love for each other? For me the question is, if there was a man and a woman who were in love who were married let's say, and who had been together for a very long time, if by some strange procedure they could have their memories erased, and then they would re-meet, would they fall in love again? Is love some kind of a force that rules us beyond our identification with each other and ourselves? My feeling is that's probably the case. I don't think any scientist has fully resolved why two people amongst the many millions of people in the world and the many thousands they might meet, why you find a partner and have this bond with a particular person. So my belief is that it is a very fundamental aspect of the way we function as human beings and that perhaps it's something that rules us, that drugs us in ways we can't explain or understand. ^ Fawthrop, Peter. "Dark City (Original Soundtrack)". Allmusic. Retrieved 2006-03-04. ^ Dark City trailer (QuickTime). Retrieved 2007-05-04. ^ "Dark City (1998)". Yahoo! Movies. Archived from the original on 2011-06-22. Retrieved 2010-09-01. ^ Carpenter, Jerry, "The City of Lost Children", Movie Reviews, SciFilm.org, archived from the original (review) on 2007-10-12, retrieved 2007-11-07, The production design by Jean Rabasse is marvelous. The city is dark and damp, all stairs and walkways. It clearly served as inspiration for DARK CITY three years later—- one scene even features sharply inclined risers filled with members of the cyclops cult just like those used by the cenobites in the later film. ^ Mestas, Alex (2003-03-03), "The City of Lost Children (1995)", DVD Reviews, LightsOutFilms.com, archived from the original (review) on September 7, 2008, retrieved 2007-11-07, The film is similar in theme and execution to the slightly better Dark City. ^ Clark, Mike (2006-05-05). "New on DVD". USA Today. ^ a b c Ebert, Roger. Great Movies: Dark City (2005). 2005-11-06. ^ "The Metropolis Comparison". Dark City DVD (1998). ^ Schmeink, Lars; Müller, Hans-Harald (2012). Fremde Welten: Wege und Räume der Fantastik im 21. Jahrhundert (in German). Walter de Gruyter. p. 170. ISBN 9783110276732. ^ Pellitteri, Marco; Bouissou, Jean-Marie; Fratta, Gianluca Di; Martorella, Cristiano; Suvilay, Bounthavy (2010). The Dragon and the Dazzle: Models, Strategies, and Identities of Japanese Imagination : a European Perspective. Tunué. p. 607. ISBN 9788889613894. ^ "Hellboy Director Talks Gaming". Edge. 2008-08-26. Archived from the original on 2010-08-12. Retrieved 2011-10-27. ^ Boucher, Geoff (2010-04-04). "Inception breaks into dreams". Los Angeles Times. Retrieved 2010-04-06. ^ a b Dark City. Metacritic. CBS Interactive Retrieved 2010-09-02. ^ Dark City (1998). Rotten Tomatoes. Fandango Media Retrieved October 12, 2018. ^ a b c Berardinelli, James (1998). Dark City. ReelViews. Retrieved 2010-09-02. ^ Ebert, Roger (27 February 1998). Dark City. Chicago Sun-Times. Retrieved 2010-09-02. ^ Stack, Peter (27 February 1998). Stunning visuals overshadow thriller's muddled plot. San Francisco Chronicle. Retrieved 2010-09-02. ^ Addiego, Walter (27 February 1998). Grave new world with a murky plot. The San Francisco Examiner. Retrieved 2010-09-02. ^ Savlov, Marc (27 February 1998). Dark City. Austin Chronicle. Retrieved 2010-09-02. ^ Anderson, John (27 February 1998). Dark City. Los Angeles Times. Retrieved 2010-09-02. ^ TCh (1997). Dark City Archived 2012-10-19 at the Wayback Machine. Time Out. Retrieved 2010-09-02. ^ Corliss, Richard (2 March 1998). Dark City. TIME Magazine. Retrieved 2010-09-02. ^ a b Vice, Jeff (27 February 1998). Dark City. Deseret News. Retrieved 2010-09-02. ^ McCarthy, Todd (19 February 1998). Dark City. Variety. Retrieved 2010-09-02. ^ Basora, Andrea (1998). Dark City. Newsweek. Retrieved 2010-09-02. ^ Sterritt, David (1998). Dark City. Christian Science Monitor. Retrieved 2010-09-02. ^ Fine, Marshall (1998). Dark City. USA Today. Retrieved 2010-09-02. ^ Holden, Stephen (27 February 1998). Dark City: You Are Getting Sleepy: Who Are You, Anyway?. The New York Times. Retrieved 2010-09-02. ^ Ebert, Roger. "The Best 10 Movies of 1998". Chicago Sun-Times. Retrieved 2005-12-20. ^ "February 27-March 1, 1998 Weekend". Box Office Mojo. Retrieved 2010-09-02. ^ "March 6–8, 1998 Weekend". Box Office Mojo. Retrieved 2010-09-02. ^ "Domestic Grosses". Box Office Mojo. Retrieved 2010-09-02. ^ "Dark City VHS Format". Amazon.com. Retrieved 2010-09-02. ^ "Dark City DVD". DVDEmpire.com. Retrieved 2010-09-02. ^ Alex Proyas Interview - Dark City Director's Cut and More. twitchfilm.net. Retrieved 2010-09-05.